Jim Mallinder revelled in Samu Manoa’s heroics after the American star scored a 13-minute hat-trick for Saints against Treviso on Saturday. Manoa came off the bench and proceeded to dot down three times in quick succession, with one of his scores more like that of a full-back than a No.8. The 29-year-old burst through the middle and turned on the turbos as he flew past a bedraggled visiting defence. 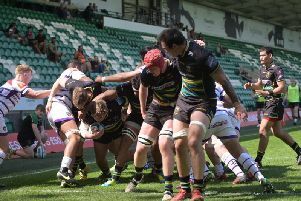 And Mallinder admitted he had never seen anything like Manoa’s burst of tries in what was a thumping 67-0 Champions Cup victory at Franklin’s Gardens. “That took some doing,” said the director of rugby.